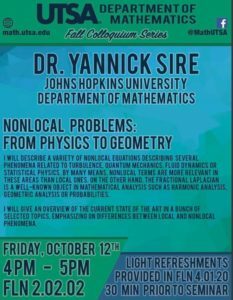 Dr. Yannick Sire from the Department of Mathematics of Johns Hopkins University will be presenting October 12th at 4 pm to discuss Nonlocal Problems: From Physics to Geometry. The seminar will focus on a variety of Nonlocal equations describing several phenomena related to Turbulence, Quantum Mechanics, Fluid Dynamics, or Statistical Physics. By many means, Nonlocal terms are more relevant in these area than local ones. On the other hand the fractional Laplacian is a well-known object in mathematical analysis such as harmonic analysis, geometric analysis or probabilities. Dr. Sire will give an overview of the current state of the art in a bunch of selected topics, emphasizing the differences between local and nonlocal phenomena.